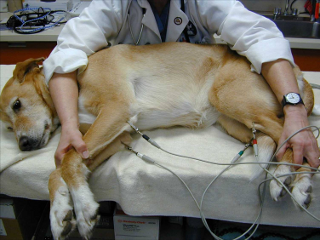 Dog with electrocardiogram (ECG) clips attached. An electrocardiogram (ECG or EKG) is a recording of the electrical activity of the heart. It is a safe, noninvasive procedure that uses clips (electrodes) placed on the skin over the chest and legs. The ECG is used commonly to evaluate the heart rhythm and identify abnormalities (arrhythmias) in the heartbeat. It may also help to identify enlargement of the heart, a common finding with many heart diseases.